ALBISO. One of the original 750 surnames adopted in Argao in accordance with the 1849 Claveria decree. The surname appeared as ALBIZU in the Catalogo Alfabetico de Apellidos though this spelling was never used in Argao. From 1849 until the coming of the Americans the spelling of the last name has always been consistently "Albiso". As a surname it is a variant of the Spanish last name Albizo, itself derived from the Basque name Albiasu. The word albiasu is a contraction of the words albitz, which means "hay", and tsu, which means "many". Thus, Albiso can be translated as "haystack". Some translations include "rocky ground" or "stony place". 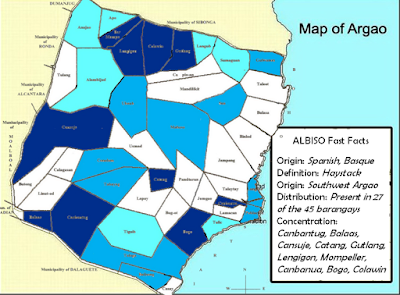 The Albiso family most likely began in the lower half of Argao, most particularly in the southwestern portion. As the current distribution of the last name indicates the family most likely began in the barrios of Canbantug, Balaas, and Cansuje. However, by the time of the Claveria decree the family was quite scattered throughout Argao, thereby making it a bit difficult to connect every line to each other. From available records most Albisos from Argao can be traced to any of 5 distinct lines. Most of its members today use the spelling "Albiso" though some members spell it as either Albeso and Alvizo. For more information on the Albiso family of Argao, please contact the genealogist. NOTE: When in parenthesis, the person did not have a surname during his/her lifetime. C. Julian Albiso, who married Barbara Tapinit. The surname Albiso is extinct in his line as all his children were women. His descendants carry the last names Mamonong (2 lines) and Morcillos. (2) Agustin Fajardo & Catalina Sarceda. Agustin Fajardo was most likely a brother or first cousin of Francisco Lembaga (see #1). He was born in the mid0-1700s. He and his wife had one daughter, Manuela Albiso, who married Ygnacio SARDONCILLO. This is another extinct Albiso line. A. Victoriano Albiso, who married Adriana Omboy. D. Balbina Albiso, who married Toribio SARONA. a. Fausto Albiso, who married Feliciana Camporedondo.